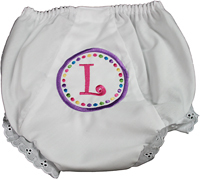 Baby Bloomers-our adorable baby bloomers are each personalized with care. These "baby bloomers" are made of 65% polyester, 35% cotton batiste and have embroidered eyelet edging. Soft elastic waist and a bias cut seat. The image you see above is an EXAMPLE of what we can do for you. NOTE: You are purchasing ONE Bloomer.